When it was launched in 1923, nothing like Skippy had ever been seen before in the comic strips. It was not just Crosby's expert draftsmanship or remarkable flair, although that artistry earned him a reputation as "the cartoonist's cartoonist"... The brilliance of Skippy was that here was fantasy with a realistic base, the first 'kid' cartoon with a definable and complex personality grounded in everyday life. The syndicated strip was enormously popular, at one point guaranteeing Crosby over $2,000 a week, an enormous sum in those harsh economic times. Grosset & Dunlap published Crosby's Skippy novel in 1929 and a radio show was soon developed. In 1931 the strip was adapted as a movie by Paramount Pictures. A success, it won director Norman Taurog the Academy Award for Best Director and boosted the career of young star Jackie Cooper in the title role. Creator Crosby retained the copyright, a rarity for comic strip artists of the time. In his heyday, there were Skippy toys, comic books, and dolls. The Effanbee Company, New York, was licensed to make Skippy dolls which they produced from 1928-1943. Marketed as the boyfriend of the popular "Patsy" doll, Skippy was 14" tall and made of composition with molded hair with a long forelock on the forehead. His custom head mold was sculpted by famed doll designer Bernard Lipfert based on the artwork of Percy Crosby. It gives us great pleasure to present the first Skippy doll made entirely of felt! 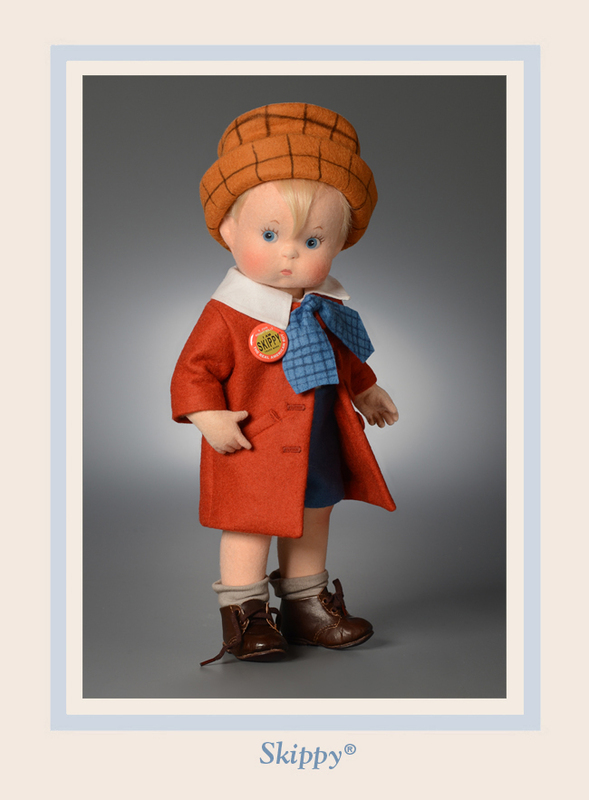 Closely based on the vintage Skippy doll design and the artwork of Percy Crosby, Skippy measures approximately 12 1/2 inches tall and is fully jointed with the RJW ball & socket system with internal wood mechanism. Skippy's hands have individually-sewn fingers and molded details. His impish face is delicately hand painted and for the first time he has a completely handknotted wig of the finest mohair. This mischievous little boy comes costumed in an authentic outfit made of the finest natural materials. A tailored cotton shirt with large collar and tie, felt shorts, overcoat, and slouch hat are based closely on the original comic illustrations. He wears cotton socks and hand-cobbled shoes made of fine custom-made leather with custom-made miniature shoelaces. On his chest, Skippy sports a special replica pinback button which reads: "R. John Wright Dolls, I AM SKIPPY® - The Real American Boy." Skippy was produced by special permission from the Estate of Percy L. Crosby in this extremely small edition of just 150 pieces worldwide. Each doll will come beautifully boxed with a signed certificate of authenticity and the forms for owner registration.